Radical [radix -(Latin) = 'root']. 2003 Election's only radical candidate, uprooting the idea of members of a Scottish parliament swearing an oath to the queen of the southern of the supposedly 'united' kingdoms. 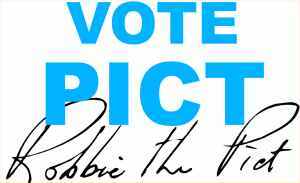 Robbie the Pict is in favour of re-planting some democratic sovereignty in our democratic kingdom - The Royal Republic of Scotland! Candidate [candidus - (Latin) = 'white']. Origin of British word 'candid', meaning frank, sincere, open, ingenuous, outspoken and freely critical. (Cf 'Candida Casa of St Martin in Whithorn.) Persons seeking election to the Roman Senate had to have a reputation for such qualities before being allowed to don the white toga of office. Robbie the Pict has not taken the Oath of Entered Apprentice at 1st Degree, nor is he a Member of the secret sodality the 'Speculative Society of Edinburgh' - unlike William Cullen the Lord President and Lord Justice General (No. 1702) and of course the Queen's husband Philip Saxe-Coburg (No. 1662). Oath of Allegiance to Elizabeth II, Queen of England, an oath taken in 1966 as a Royal Air Force Policeman. In so doing Robbie considers himself released from the constraints of his obligations under the Official Secrets Act, as of 0001hrs on 14 April 2003. "I will to the utmost of my power maintain in the United Kingdom (whichever one that is!) the Protestant Reformed Religion established by law." Whilst having no difficulty with Christian sectarianism per se, at least equal in credo status with ancient native naturalism, Robbie considers that Elizabeth II might be serving too many masters, both spiritual and temporal, for the full good of the full community of Scotland. Following discussions with the executive of the SKAT Legal Group, Robbie had intended to stand 'Against Anglo-American Criminal Road-Tolling'. Surprised to see an unlawful prohibition on using a six-word description for individual candidates, re-inforced illegally by the UK Electoral Commission officer in Edinburgh [Andy O'Neill 0131 225 0200], Robbie decided to raise the issue to a national defence level by attempting to stand for the civil rights of the people of Scotland and Shetland. An interdict hearing on the unlawful tampering with the democratic process has been granted by the saintly Lady Paton, who cannot be a Member of the Spec because she is a woman. Robbie the Pict has worked without wages or dole for almost 8 years as a community attorney, dedicated to the removal of criminal tolls on the A87 to Skye. This work has contributed to the issue of discount tickets and the freezing of toll levels. He also initiated a 3 year private prosecution of Queen Elizabeth II for resetting of stolen goods, namely the Stone of Scone, property of the community of Scone in Perth-shire. This work was interrupted while the Stone had only reached Edinburgh but will be resumed when reparation is made concerning the £28m illegally extorted from Skye and those wrongfully convicted are compensated. 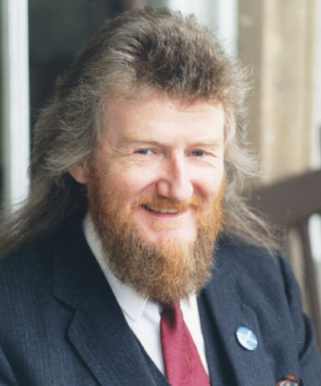 When not obliged by surrounding civic duties, Robbie is one of Britain's leading ethno-linguists, known in such circles for identifying the origins of the native Alban or Vannic tongue in its pre-Gaelic form. He also sings the Blues and describes himself as playing 'haphazard harmonica'. This he has done with Junior Wells, John Mayall, Tam White, Big George and the Business and once with the legendary Blues and Trouble. Robbie is driving around the Highlands and Islands trying to catch up after spending the first week of the campaign demanding 5 hearings in the Court of Session, but sends his kindest regards to all and good luck to the candidates. The People of Scotland are included in the 1952 Oath, taken by Queen Elizabeth II of England. Otherwise Her Majesty Commits Treason. The current ‘parliament’ is but a franchise (Section 11, Scotland Act 1998), disrespectful of Scotland- and unlawful. The Ancient Sea Kingdom of Zetland remains Free, Omitted from the English Act of Union of 1706! Printed and published by the Scottish Peoples’ Mission, DUNVEGAN, Isle of Skye.